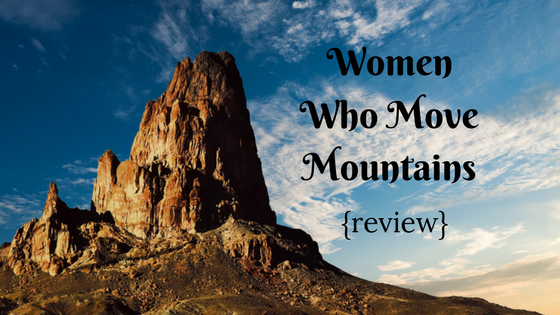 I was drawn to the title of this book- Women Who Move Mountains: praying with confidence boldness and grace. Who doesn’t want to pray with more confidence and boldness? I know prayer is a key to my success as a wife and mother, so I am always glad for encouragement in that area. Women Who Move Mountains was written by Sue Detweiler. Prayer was never meant to be a recitation of requests, but rather a drawing close to the heart of God. When you learn to exchange the obstacles of life for the promises of God, you will pray with passion and confidence rather than fear or insecurity. From this place of surrender and intimacy, you will discover what it means to become a powerful, effective woman of prayer–a woman whose life overflows with springs of living water that transform not only her own life, but the world around her. The book is divided into two parts. In the first part, the odd chapters focus on your relationship with God and give the stories of women, both from the Bible and otherwise, who suffered brokenness and abuse in their lives and how they found victory and wholeness. The even chapters invite you to dig into God’s Word and discover what it has to say about prayer and your life. The second part of the book is a twenty-one-day devotional meant to be used to refocus your life and take you deeper in your time with the Lord. I found the various stories in the book distracting, but that might be because I didn’t feel like I could relate. However, this book might be helpful for those who are struggling with abuse and broken relationships. I appreciated the chapters that were focused on scripture and encouraged you to dig into the Word to see what God has for us. If we want to be women who pray with mountain-moving faith, God’s Word is truly the key to awakening faith in our heart.